No, you whisper to yourself, he’s an artist. A human being. I agree, 100%. 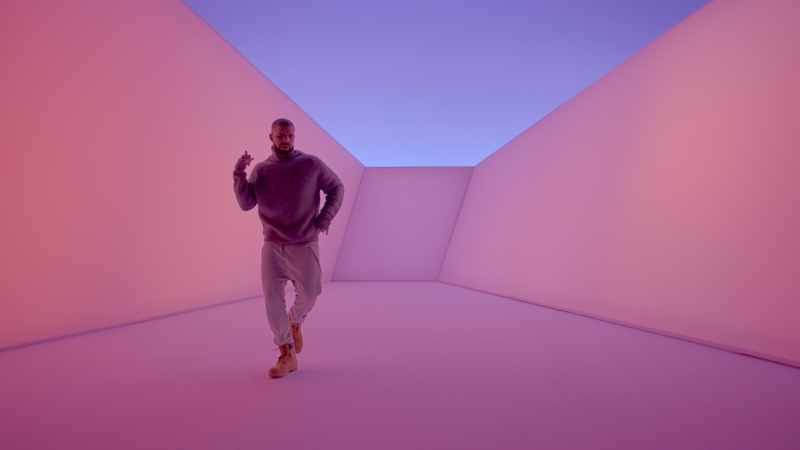 But some argue that the way Drake approaches his work and his product is intimately connected to technology and digital media. In other words, Drake treats his songs not as static emblems of personality, but as malleable, scalable platforms for maximum participation from listeners and fans—almost like a musical equivalent of Facebook. One could go even further and argue that Drake is like a VC-backed startup, the VC in his case being a major label (his first label contract was in 2009 with Lil Wayne’s Young Money Records, a subsidiary of Republic Records; he now releases through his own label OVO Sound, a subsidiary of Warner Bros. Records). This means not only that Drake has more than enough capital to scale quickly, but also that he’s obligated to chase 10x returns on his projects—such that anything less than a musical equivalent of Facebook, in terms of global cultural relevance and user-level customizability, simply won’t cut it. OK, so that’s Drake: a man who has been in the music business for over a decade, who has billions of streams to his name, and who can afford to take more ambitious career leaps. He’s also not the first major artist whose magnum opus onlookers have compared to software. But what about the DIY artist who’s just starting out and struggling to make ends meet? What are the implications of these artists relying on tech metaphors—from “open-source software” to “VC-backed startup”—to govern their careers? Does such an approach actually work, or is it detrimental to one’s creative vision? Musicians are a product. We have a difficult time conveying to the audience that we’re people. I don’t agree with that second sentence, but the first sentence reaffirms that artists are inseparable from their work. They are simultaneously the entrepreneurs and founders of their own businesses and the products that they and their managers, agents, labels and other fellow team members are trying to sell. Artists’ relationship to their own products is therefore integral to their sense of self. As a musician, I completely understand the perils of this “productization” of art. Musicians, after all, are not Amazon Echo Dots or Samsung refrigerators or Ticonderoga pencils. Musicians are creative human beings with deeply personal histories and vibrant souls, who have dedicated their lives to self-expression and entertainment. Yet, if we look at the Merriam-Webster definition of an entrepreneur—“one who organizes, manages, and assumes the risks of a business or enterprise”—DIY artists fit that definition like a glove, dirtying their own hands in growing their careers and taking on all of the risk. Recognizing this entrepreneurial affinity, a growing number of music companies are being founded on the premise that an artist’s product is no longer just a song or album, but also a wider brand that can and should be spread out across multiple revenue streams (for key examples of this philosophy in action, see the controversial press release behind artist services startup United Masters, or the design-thinking approach at Oakland-based artist accelerator Zoo Labs). This is the first in a series of thought experiments I will be writing over the course of this year that puts this technocratic approach to the test. Yes, many brilliant founders and investors have built revolutionary companies off the backs of game-changing frameworks for thinking about tech and innovation—but what if we tried to apply those frameworks to a musician’s career? Would that sharpen or blur our understanding of how to execute on a creative vision effectively in the digital age, and of how the wider music business works? I hope it becomes clear throughout this series that the answer to this question isn’t black and white. Nonetheless, I think it’s about time that we stop haphazardly throwing out tech metaphors to describe music and its creators, without critically analyzing these comparisons and debating whether they actually make sense. The first framework I’ll be discussing is the tech adoption life cycle, which was introduced in 1957 to describe the advancement of agricultural tools and has been adapted for nearly every technological paradigm shift since. As Geoffrey Moore explains brilliantly in Crossing the Chasm, there is a crucial strategic rift between the first two adopter segments, known as the early market, and the latter three segments, known as the mainstream market. 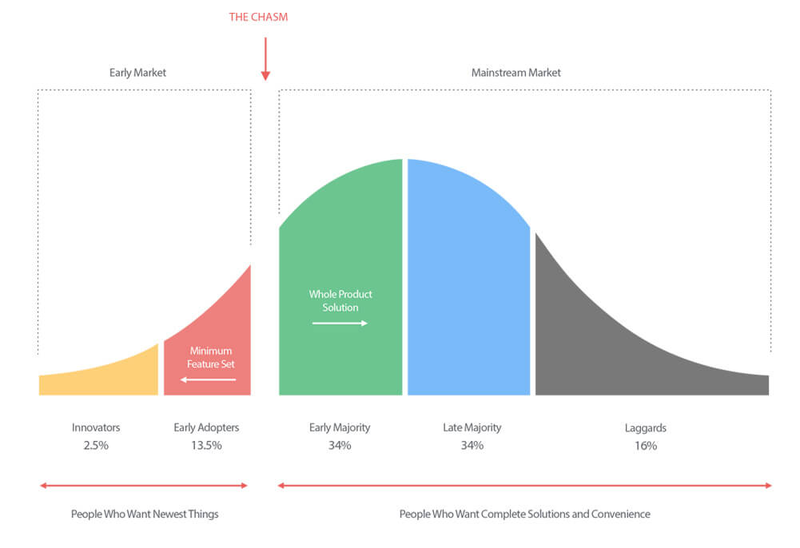 Many entrepreneurs fall flat because they take a quick glance at this bell-curve visualization and assume that the transition from the early to the mainstream market is straightforward and seamless. In reality, it requires a complete 180 in how you define and communicate the value you provide to your customers, and is difficult to pull off operationally (I will explain why in a separate blog post later in this series). Below, I try to retool this framework into an Artist Adoption Life Cycle, outlining the first three adopter groups (leaving out conservatives and laggards) as they might manifest for DIY artists trying to share their art and make it in the real-world music industry. I borrow loosely from Moore’s descriptions of each segment, replacing any mention of “tech” with “music”—and hope to demonstrate that a seemingly simple substitution is much more complicated, and perhaps unjustified, once you look under the hood. Innovators appreciate great music for its own sake. They are the gatekeepers for any new artists entering the market, and the other segments in the Artist Adoption Life Cycle deem Innovators competent enough to do early evaluations of new music for them. However, Innovators don’t necessarily have any money or funding to follow up on their evaluations, and are not powerful enough to dictate others’ buying decisions—that is a job for later segments in the cycle. Many Innovators are discovery-driven: the types of listeners who pore through their Discovery Weekly, Release Radar and Daily Mix playlists on Spotify, the delightful, long-tail variegation of the Bandcamp homepage, and/or the ever-growing list of niche music subreddits (r/jazznoir anyone?) trying to find the next great song. Crucially, these discovery-oriented listeners are not necessarily driven by metrics, newness or commercial potential, but rather by artistic quality as determined by their own individual tastes. Others in the Innovator segment might be exclusivity- or intimacy-driven: they’re passionate about watching Facebook Live studio session videos recorded days before a single or album is released, or might enjoy listening to and giving feedback on artists’ works in progress. SoundCloud, DatPiff and YouTube are Innovators’ platforms—not just because distribution is immediate and low-cost, but also because many up-and-coming artists post rough drafts or early tracks of their works on those platforms months and even years before topping the Billboard charts. Music professionals usually refer to exclusivity- and intimacy-driven Innovators as “superfans,” and to discovery-driven, non-sticky Innovators as “casual fans.” Already, here is where the Artist Adoption Life Cycle gets messy and diverges from tech. The general tech industry would probably also call Innovators “superfans”—but they are superfans of technological innovation more broadly, not of a single product. Because they want to remain objective in their evaluations, Innovators try to diversify the range of products they consume as widely as possible; the last thing they want is to be beholden to any one specific technology or company. Moreover, by nature of how the adoption cycle works, Innovators are well aware of their status as feeders into later segments of the cycle, so as a company scales further and enters the mainstream market, their relationship with Innovators will naturally disintegrate. This contradicts how the music industry usually defines superfandom. The most influential theory about superfans is Kevin Kelly’s 1,000 True Fans, which argues that you need only 1,000 fans, each of whom is willing to spend $100 annually in support of your career—whether through buying records, merch, live shows or other products—in order to make a living as an artist. The underlying assumption in the 1,000 True Fans theory is that superfans are not a means to an end, but rather the end in and of itself—in other words, that the mainstream market doesn’t matter. As long as you identify and nurture your Innovators and Early Adopters in the early market, says Kelly, you can sustain yourself successfully; there is no need to scale, nor to feed your product into later adopter segments. As an example of where this can create tension in the music industry, Spotify, the world’s largest streaming service by market share, arguably operates on tech’s definition of what it means to be a superfan, and not on music’s definition. The ideal Spotify user is a fan of Music in broad strokes with a capital M—and of the Spotify platform itself—more than they are a fan of any one particular artist. Just look at Spotify’s 2017 Wrapped end-of-year campaign, which seems to gamify and praise music listening diversification. For instance, my 2017 Wrapped told me that I listened to 2,666 different songs by 1,103 unique artists and “explored” 32 different genres that year. In this environment, exploration trumps devotion, breadth trumps depth. Am I, the Spotify-nurtured Music superfan whose attention is thinly spread and always on the move, the person to whom artists and labels really want to market for lasting impact? Or would they thrive more off of another model? Early adopters, whom Moore calls “Visionaries,” are passionate about matching emerging artists with innovative, strategic business opportunities, and about conceptualizing high-visibility, high-risk projects to bring these opportunities to life. While they are in close contact with Innovators, Visionaries are driven more by business goals than by purely creative/music goals at the end of the day; the actual music itself is important only insomuch as it promises to deliver on a grand business-facing vision for the future. More importantly, unlike Innovators, Visionaries actually have ample funding to drive their goals forward, and therefore can have a tangible impact on ohers’ buying decisions. In a B2B music context, Visionaries are the types of label execs who stay in close contact with indie bloggers, curators and niche online communities in the Innovator segment, while still keeping a focused eye on metrics when making business choices. They are passionate about underground trends, but also constantly monitor and beta-test charts and analytics platforms like Hype Machine, Next Big Sound and Chartmetric. Music-focused accelerators are also important Visionary environments in that they straddle the boundary between up-and-coming talent and strategic business potential. Techstars Music currently has four Artists in Residence, each of whom sees a mutually beneficial opportunity at this point in their career to align their music with what the latest startups in the industry are building. For other examples, see the aforementioned Zoo Labs, artist-management firm Th3rd Brain’s artist accelerator, and Universal Music Group’s Berlin-based incubator UMx Space. Increasingly, as artists and their teams seek alternative sources of funding beyond the traditional label model, Visionaries also exist in brands outside of the music industry. Initiatives like Red Bull Music Academy and Converse Rubber Tracks maintain a reputable footing in Innovator-facing music scenes, but are crucially tied to larger brands that have a solid, core business strategy as well as the confidence to spend capital on more ambitious creative projects in a way that doesn’t steal from said core. Artists are drawn to these initiatives as much for the brand name as for the financial resources involved. If we go beyond B2B examples and look at listener communities, Visionaries are the types of listeners who are driven as much by social validation as by the quality of the music itself. Just as with indie label heads, Visionary listeners are more likely to check out indie and underground acts if they have the numbers and “trending” status behind them (i.e. they would much rather openly support Chance the Rapper than a rapper of equal caliber with a tenth of Chance’s follower count). They’re also the type of music fan who attends small- to mid-size music festivals as much for the artsy Insta as for the opportunity to discover a diverse lineup of artists for the first time. Visionaries on both the listener and B2B level comprise a really important market for emerging artists who are looking to scale, but because Visionaries demand some well-defined strategic purpose before investing any capital in new music, artists can’t just make a song and expect the Visionaries to come—that’s what the Innovators, who don’t have any money, are for. Instead, artists need to study the larger vision and commercial motivation of the Red Bulls, Converses, Techstars and Hype Machines of the world, and position their music and personality in a way that aligns with said vision and motivation (I’ll be writing a blog post later in this series about positioning for artists). The members of the early majority, whom Moore calls the “Pragmatists,” are much less ambitious. Unlike Visionaries, Pragmatists are not aiming to become tech-savvy pioneers and make quantum leaps forward into the future, but rather care about incremental, measurable, predictable progress. Pragmatists want to invest only in proven market leaders, and are especially concerned with the reliability and support infrastructure around products, and whether such infrastructure can align with the products they and their institutions are already using. This is the crux of how “strategy” works at any large corporation: it’s not about being on the frontier of innovation, but rather about clutching tightly to your core business values and maintaining the things you already do well. Revisiting Moore’s concept of the chasm between early and mainstream markets, Pragmatists and Visionaries are incompatible because the former care more about the bottom line and are much less willing to take risks, and will only make deals with emerging artists and startups if they can draw a direct line to revenue. In contrast, Visionaries are freer to prioritize technological innovation over financial performance, and don’t feel the need to confine their vision to existing product infrastructure or to respect their colleagues’ existing experiences. On the B2B level, most major-label and mainstream radio execs are Pragmatists by necessity. They won’t take a meeting with artists unless they are proven market leaders, i.e. unless they have the social media velocity metrics to back themselves up. In other words, industry Pragmatists often treat artists like athletes: artists are what their numbers (streams, followers, revenue, etc.) say they are, no more and no less. Like in Hollywood, industry Pragmatists also tend to lean toward artists and sounds that already feel familiar to their ears, which is how you end up with dozens of songs on Top-40 radio stations that all have the same beat and chord progressions. And even in this data-driven culture, long-term relationship-building also still matters in a Pragmatist world. Just look to the grueling radio tours that aspiring country stars need to do in order to get even a small chance of their single playing over the airwaves, a ritual that’s also common in other genres like hip-hop and rock. Each radio visit can cost a label hundreds of thousands of dollars—the type of budget that only Pragmatists can afford. Beyond the music industry, execs with the phrase “strategic partnerships” in their job titles can be either Visionaries or Pragmatists, depending on where they work. In contrast to the Visionary, underground ambitions of Red Bull and Converse, the music marketing partnerships run by the likes of Coca-Cola, Pepsi, Chevrolet, Citibank, Mastercard and Cracker Barrel tend to involve much more mainstream artists, and the resulting content is much more risk-averse. I wouldn’t go so far as to say that major labels are driven by fear per se, but they are definitely driven by a quantifiable reduction of risk. This isn’t inherently good or bad; it’s just how massive corporations stay alive and satisfy their shareholders. On the listener level, Pragmatists are the types of listeners who not only care about staying up to date with the music that’s topping the Billboard charts, but also don’t want to be challenged by any new music they hear. They are the types who see music as serving a more utilitarian function, in the background of everyday activities—i.e. streaming Spotify’s mood- and context-based playlists on loop while studying, working out or doing laundry. Oddly, this behavior is close to my description of the discovery-driven Innovator, in terms of engaging more with Music-with-a-capital-M and with the platform more than with the artist. Spotify categorizes and promotes many of its playlists in a way that caters to Pragmatists, not Innovators or Visionaries. Scrolling through the “Browse” tab on my Spotify mobile app, I am presented with invitations to listen to a variety of mood playlists, such as “Beast Mode” (nearly 3.6 million followers as of publishing this), “Coffee Table Jazz” (1.4 million followers) and “Evening Acoustic” (1.3 million followers), that are equally if not more popular than many of their genre-centric counterparts. As Spotify plans to go public this year, and as Pragmatist listeners naturally make up the largest listener segment in the adoption cycle, this utilitarian play will only grow. This creates a slight problem for DIY artists who are trying to target Innovator and Visionary markets while adopting a “Spotify-first” marketing strategy. Consider the fact that songwriters are already feeling the pressure to create music that “sounds like Spotify,” in order to maximize their chances of high-profile playlist placement, which leads to more revenue. What if there comes a time where “Spotify-first” means “Pragmatist-first,” when music’s more utilitarian, context-based function is front-and-center on the platform? Any seasoned tech entrepreneur knows that marketing to Pragmatists before securing feedback and approval from the Innovators is a strategy doomed to fail—but this is precisely the dilemma that a Pragmatist-first streaming service would set up for the DIY community. If you’re still reading, you might be wondering why I’ve bombarded you with so much information about this arguably arbitrary framework for consumer segmentation that doesn’t even come from the music industry. I hope my friend’s quote above points to a potential answer: the number one reason artists get jaded about the music industry is because their expectations don’t align with the reality of how a certain part of the business works. More specifically, an all-too-common mistake that artists and their teams make is trying to strike a deal with Pragmatists using the same pitch you gave to Innovators and Visionaries, and vice versa. If you enter a major-label meeting with an Innovator’s approach and try to convince the execs to invest in your music on the basis of musical quality and “creative merit” alone, you most likely won’t get a response. On the other hand, if you already have the funding and support of a Pragmatist or Visionary but no Innovator-approved foundation on which to build further, your grand plan will also fizzle out. I also hope I demonstrated that streaming platforms make the boundaries between adopter segments blurrier than ever—but in some cases, it becomes clear where the boundaries are, and how they might be grossly misunderstood. A relatively recent example of this is the marketing campaign behind semi-viral 15-year-old rapper Bryson Morris, whom industry execs claimed had a star factor of up to $100 million even though he released only three songs, the videos for which got less and less traction over time (“#LOUISGUCCI” has 634,000 views as of publishing this, “Crazy” has 120,000 views, and “Trending Remix (Winning)” has merely 3,600 views). To bring the VC metaphor back full-circle: a feature in The Ringer described the teeny-bopper as “a promising internet startup with lots of VC funding but no revenue.” Hopefully, in outlining the Artist Adoption Life Cycle above, it becomes clearer as to why Bryson Morris is a startup, why he got that VC funding, why the revenue he expected isn’t there, and how, as an artist, you can maximize your chances of avoiding that mistake. As I mentioned at the outset of this blog post, these issues in the trenches of music and tech are not black and white. Did I miss a crucial member of any of the segments in the adoption cycle? Was this whole exercise futile? Did any of my comments strike a chord, positively or otherwise? If yes, I’d love to hear about why in the comments section below! To read more of my thoughts on music, creativity, technology and business, you can follow me on Twitter and/or sign up for my weekly newsletter, Water & Music.